(August 20, 2014, The Auk: Ornithological Advances)—Nest predation is the single most severe cause of reproductive failure by birds. It is especially curious then how birds, including White-rumped Sandpipers (Calidris fuscicollis), that nest on the ground, in the open, and in the high arctic’s never-ending summer days, are able to keep their nest safe for 3 weeks. To breed successfully, individuals of this and other bird species must escape predators that seek an easy meal of eggs, attacking both from the ground and from the air. 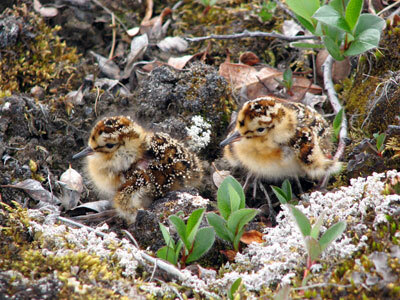 Typical explanations evoke the camouflaged plumage of the incubating parent(s) and the cryptic colors of the eggs of shorebirds nesting in the open tundra which help the parents to escape predation until the chicks hatch. Surely, hiding the nest can only help, but new research by McKinnon and colleagues suggests that camouflage may not be enough. Their data suggest that unless there is an abundance of alternative prey available to be caught by arctic foxes, snowy owls, and a slurry of other predators, the chances for sandpiper eggs, and artificial nests baited with eggs, to make it through hatching, can be as low as nil. The researchers point to lemmings for the answers: In years when these arctic rodents are common, nest predation rates are low, and when lemmings are sparse, most every bird egg may be eaten before it hatches. Ecological theory has long predicted an important role of the interactions between birds and rodents, both prey to the same guild of predators, in shaping the annual success and productivity of local populations, but empirical research is not only critical to test these theories, but also involves difficult field work and long-term studies to generate the necessary data. See the open access article athttp://www.aoucospubs.org/doi/full/10.1642/AUK-13-154.1. Previous Previous post: For Gannets, It Pays to Follow (When Looking for a Meal)!